George Follmer eases his oh-so-powerful Porsche 917/10 around the demanding swoops of Watkins Glen, New York State, 23 July 1972. Follmer won the Can Am that year after taking over the drive vacated by Mark Donohue who had a disastrous second round practice crash at Road Atlanta, Georgia in July. Follmer was a wise choice by Roger Penske, the right mix of speed, engineering nouse and mechanical sympathy to deliver the goods at short notice. 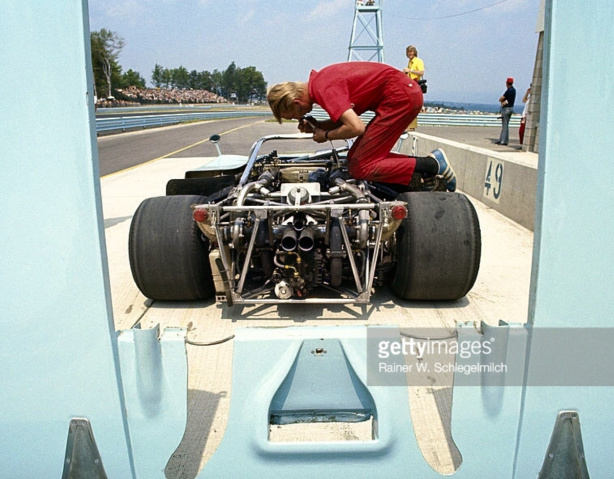 Watkins Glen was Follmer’s first race in the challenging 917/10, he was 5th, the hitherto dominant McLaren’s of Denny Hulme and Peter Revson were first and second- it was the last race win for the McLaren works team in the Can Am. 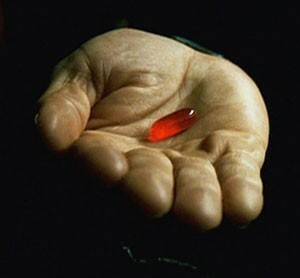 I must admit I have always been in two minds about these beasties. On the one hand they are very clever bits of engineering in adapting an existing race winning design made redundant into an altogether different and equally successful bit of kit. On the other, their dominance effectively, along with some silly SCCA rule decisions, destroyed the best ‘Formula Libre’ racing category on the planet. Make that the best racing category on the planet. Porsche had of course competed in the Can Am before 1972, the decision to get serious was effectively made on its behalf by the FIA in making redundant the Group 5, 5 litre Porsche 917 and Ferrari 512S cars which provided two of the best ever seasons of sportscar endurance racing in 1970 and 1971. Zuffenhausen’s existing 3-litre 908 was unlikely to be competitive with the Grand Prix engined designs of Ferrari and Matra, a completely new 3-litre engine would have been required under the new endurance racing rules. 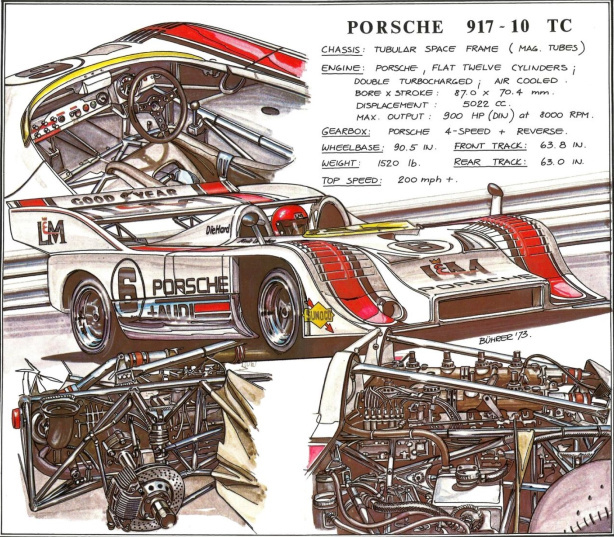 So Porsche planned to spend its racing budget on winning the Can Am in its most important single market— using the existing 917 package of engineering goodies as rather a sound base. 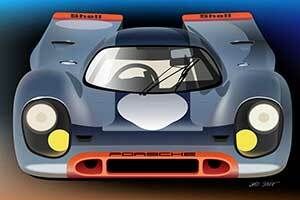 After the 1971 Le Mans classic was won by the Gijs Van Lennep/Helmut Marko Porsche Salzburg 917K a new open ‘Spyder’ designated the 917/10 was built based on the leanings of the open cars raced by Porsche in the Can Am in 1969 and 1970. Jo Siffert raced the new car in four 1971 Can Am meetings before his untimely demise in his F1 BRM P160 in the Brands Hatch Victory Race. Jo took two 2nds at Mid Ohio and Road America, 3rd at Watkins Glen and a 5th at Donnybrooke in the series won again by the dominant papaya McLarens, this time by Peter Revson in an M8F Chev. Private owners of 917 Coupes were given the opportunity to convert their cars to Group 7 specification inclusive of a 5.4 litre version of the big Flat-12, a change achieved by increasing the bore to 90mm. The ultimate power increase was not as appreciable as the jump in torque as the valve sizes and timing were as per the original 4.5 litre lump. At about this time the commercial arrangements between Porsche and Penske Racing were concluded for 1972 (see tailpiece). 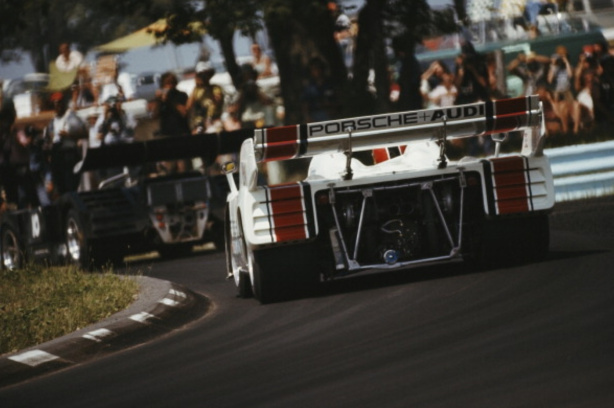 Most of the development efforts went into the turbo-charged 917/10 to be raced by Mark Donohue. The development efforts required were truly stunning to take the existing space frame design and evolve it to cope with circa 900bhp rather than the 450bhp 4.5 litre flat-12 engine first fitted to the chassis in 1969. Then there are the aerodynamics and the small matter of an engine with sufficiently good throttle response for road circuits, not something achieved before by a turbo engine. After the contracts were signed Donohue, Penske and Senior Engineer Don Cox traveled to Germany to meet the Piechs, Helmut Flegl ‘who was to be our only contact with the Porsche factory. He and no-one else was to make decisions at their end’ Mark Donohue says in his ‘The Unfair Advantage’, the superb book written by him together with Paul Van Valkenburgh. 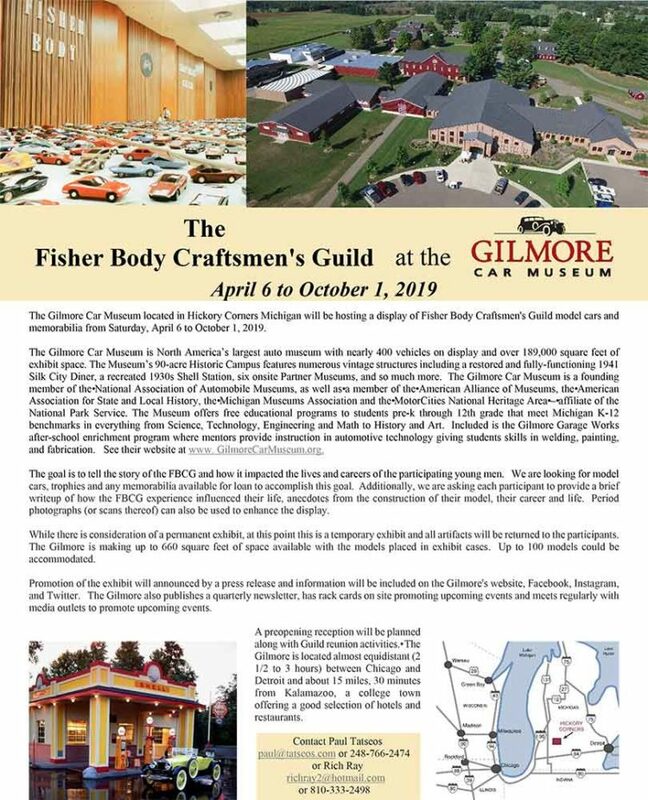 During that first visit the Americans were stunned by facilities which Donohue likened to Chevrolet R&D albeit on a much smaller scale ‘We were truly impressed. We reckoned all we had to do was put the operation in the proper gear, push it forward and we would have unlimited success’ said Mark. It was to be not quite that easy. An amusing anecdote of that first trip to Germany was Donohue being asked to do some laps in the test car. 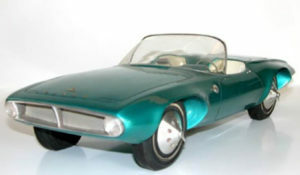 It had about 1500 miles under its belt in the hands of Willy Kauhsen under Flegl’s supervision. Donohue had endured a couple of long boozy nights with his new colleagues and a big lunch but he figured the request for some action shots, in a car he had never sat in before, would be ok. When Donohue stopped Flegl told him he had done a time of 53 seconds against the lap record of 51.5. He was expected to better it! 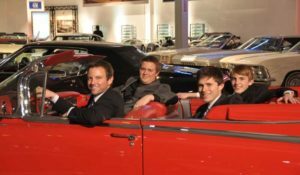 Donohue then jumped into the car and got below the record; all were pleased except Flegl and Kauhsen who had put 1,500 miles on it only to have Donohue go quicker having not sat in the car before, hung over, all in the space of about three hours! “Flegl figured I had gotten him fired. But because Cox and I had already done a good job (in the days earlier) convincing him of our combined forces approach, we were able to keep the relationship from falling apart,” said Mark. Donohue intended to devote three days to chassis testing but stayed in Germany for three weeks!, working with Flegl on every variable, using the test track and two skid pads—one with a 100, and one with a 400 foot radius. 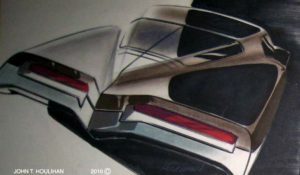 The cars chassis had to be slightly redesigned to accommodate the turbo installation and the wheelbase increased by 5/8 inch to allow the more rearward position of the driveshafts. Very stiff titanium springs and roll bars were fitted with lateral accelerations of greater than 1.6g measured on the Weissach steering test pad. 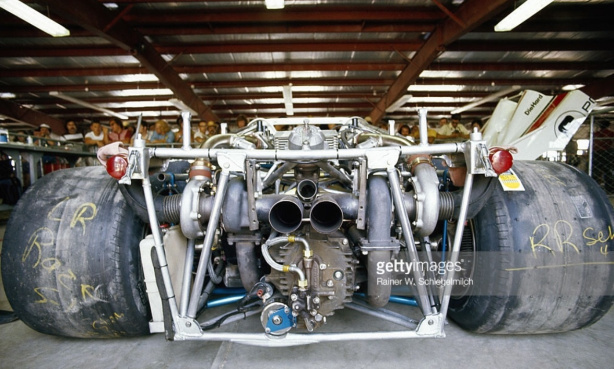 917/10’s sold to private owners had aluminum frames, the weight only increased marginally to 60Kg with additional reinforcements made necessary by the engines colossal output. Amazing really. The magnesium development frame had done more than 3500Km practicing and racing at Le Mans, a magnesium framed car was one of the two supplied to Penske for the ’72 season. Paul Frere records that the magnesium frames were so difficult to weld that only two specialists at the factory could ‘fizz’ the things together. The mag frame saved 32lbs over the ‘ally ones, total weight of it circa 100lbs with all attachment brackets. The pioneering work on turbo-charged racing engines was done in the ‘States in the mid-sixties to keep the venerable Offenhauser 4 cylinder engine competitive against the new, sophisticated DOHC Ford ‘Indy’ V8. Stu Hilborn, the fuel injection expert, engineer Herb Porter and Bob DeBisschop of Garrett AirResearch, a manufacturer of turbo’s for Diesel engines most notably contributed. With a standard Garrett TE06 diesel turbo unit running up to 100,000rpm, and capable of delivering 1.7 bar of pressure—the Offy gave 625bhp at 1.2 bar of pressure, any more than that and the modified 168cid blocks were in mortal danger. This was 150bhp more then the fuel injected 255cid Offy it replaced. With development this grew to 800bhp by 1971, as power grew throttle response diminished and this of course was the big engineering challenge Porsche had to meet. It was one thing racing open-wheelers in top gear on long corners of constant radius, another thing entirely in road racing where instant throttle response was everything. Further inspiration for Porsche came from BMW who won the European Touring Car Championship in 1968. Swiss engineer, Michael May, the same guy who pioneered wings on racing cars, developed a blown version of BMW’s 2 litre engine which gave 270bhp on 1.1 bar of boost. Despite detonation dramas the car won 4 races before turbo’s were banned in touring car racing. 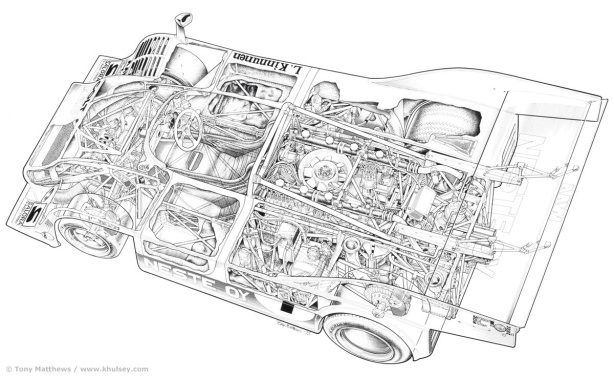 At this point, 1970, Porsche started playing with a turbo-charged 2 litre 910 engine, then switched to a 4.5 litre 917 engine using Eberspacher turbos. Fundamental reserves of Porsche engines are something easily understood once every had a chance to own one- I have in mind my over 225000Km ’85 Carrera 3.2, a 15 year old car when I bought it, and a daily driver for 7 years. The engineering of the things is superb and so it was for the 917 engine which was not significantly altered despite the 950bhp developed by the 5 litre turbo compared with the 580bhp claimed for the 4.5 litre normally aspirated motors, around which the original design work was done. The compression ratio was lowered from 10.5:1 to 6.5:1 by changing the pistons. Inlet valve lift and valve overlap were reduced by substituting an exhaust camshaft for the inlet one and then making an inlet manifold to feed the exhaust gases to the turbine and another to take the compressed air to the intakes via a pressure balancing plenum chamber over each bank. Valentine Schaffer was in charge of engine development. When Hans Mezger’s team did initial drawings for the 917 Turbo engine amongst key design tenets was the decision to use two turbo’s, one per bank of cylinders for the simple reason that two small turbo’s would ‘spool up’ quicker than a big single one offering better throttle response. The chosen Eberspacher Turbo’s were adapted from industrial diesel units. They ran up to 90,000 rpm on ball bearings and delivered 0.55 of charge per second at a temperature of 150 degrees centigrade, the exhaust temperature went as high as 850 degrees. To withstand such heat the housing was aluminum but the turbine was made of steel. The induction system was simple- log type manifolds were used for each bank of six cylinders with each turbo feeding one of the simple plenum chambers driven by the exhaust system. The two induction systems shared a common wastegate with a crossover pipe to equalize pressure on each side. A Garrett wastegate was used and operated as it did in Indy racing. It had a diaphragm valve controlled by an adjustable-tension set spring which allowed the valve to open once the boost pressure was high enough to overcome the set tension. The idea was not to obtain maximum boost, but to obtain steady boost over a workable power band. 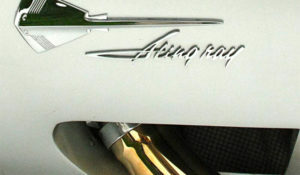 Early development problems included exhaust valves seizing in the guides, the heads were unmodified with the reduction in compression ratio and inlet cam profiles noted earlier. By mid 1971 Schaffer had improved durability such that a 4.5 litre engine survived an 8 hour full power run ‘something which reportedly could not be said for the dyno to which it was bolted’!! The real dramas though were on the test track though where the drivability, read engine response was impossible, and even then after difficulties in just getting the engines to fire, to start. Part of the problem was an engine test cell fire which cost 3 months development time in mid 1971. The first test ‘victim’ was Willy Kauhsen who tested chassis 917/10-001 at Weissach early in the summer of 1971, Ian Bamsey reports a traumatic experience for the Porsche test driver. At first it took an hour or two to start! And when it eventually stated it went slowly, then suddenly exploded, there was nothing in the middle of the power band. And there was long, long turbo lag. “Unacceptable” he quotes Helmut Flegl as saying. By the end of the year Kauhsen had his time on the Weissach test track to 49.1 seconds, two tenths quicker than Donohue in the same chassis but with a normally aspirated engine. Jo Siffert had the same difficulties driving the car at Weissach and Hockenheim. 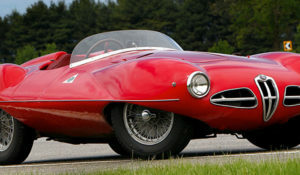 The cooling fan size was retained although the speed was increased to 1.2 times engine speed. By now the engine timing had been fixed at 22 degrees B.T.D.C. To stop the engine running on, the injectors had been positioned lower down and close to new butterfly throttles- fuel had been spilling even after the pump supply had been cut. 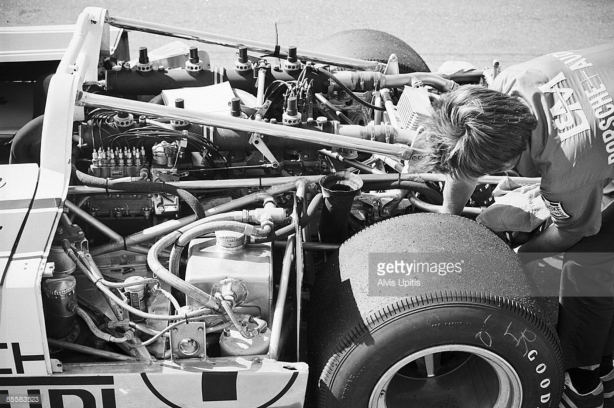 The fuel injection system was the usual Bosch unit used on the 917 throughout and required lots of tweaking during early 1972 to get the engine race ready. Penske were delivered a car which was identical to the chassis Flegl and Donouhue had optimised at Weissach. Whilst waiting for a replacement engine, the team blew one having run it with insufficient oil. Woody prepared an alternate front suspension, which incorporated the long swing-arm. “It wasn’t exactly what I wanted, but it was the best we could do within the structural limits of what we had. The rear roll centre was still too low. We could look to the rear after we got the front suspension working right.” At Atlanta the car was immediately one second a lap quicker with the new front suspension, Donouhe telexed Flegl, the changes were made to the chassis at Weissach, taking the approach even further and producing exactly what Donohue wanted. Back again at Road Atlanta, with the changed suspension geometry, altered springs and bars and with the split-flap rear wing the car was five-tenths under the circuit record. At that stage Donohue writes he was not convinced the team needed the turbo engine, with Penske assuring him the twists of Atlanta were different to the demands of a power circuit like Riverside. A test at Riverside proved they had enough downforce at the rear, the difficulty was trimming it at the front, where the various profiles tried never achieved the downforce needed. 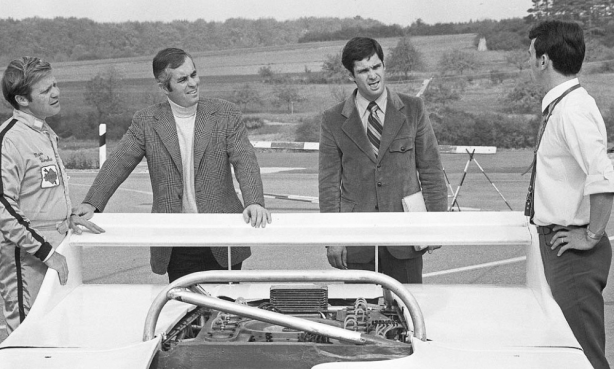 Donohue’s first introduction to turbo road racing was at Road Atlanta in late January 1972, the latest iteration of the engine was installed in the Penske team’s test spyder, 9117/10-003. Mark found the task impossible, after towing the car to start it, he had the same driving experience as Kauhsen and the late Jo. After another test in March, again at Road Am, and this time with the press present after which Mark returned to Weissach with the Porsche engineers. “I decided it was foolish to spend any more time in the states. 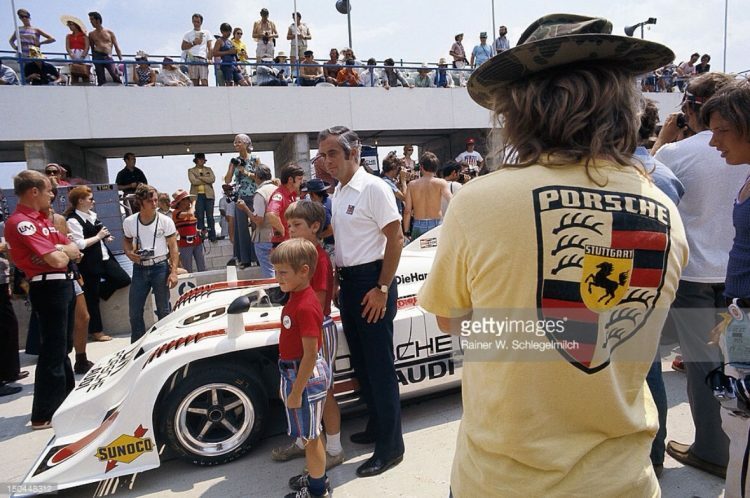 I told Flegl I’d go to Germany to work with their engine men personally.” With Penske watching he struggled to to do a lap of 49.7 seconds at Weissach. At that stage both men thought the early Can Am rounds should be missed until the engine was driveable. Donohue then easily took ‘001’ around the test track in the record time of 48.9 seconds, other than the addition of extra valving the engine was ready to race; one more butterfly valve on each manifold, linked to the throttle and designed to bleed air out when the throttle was closed and four suction operated valves were located on top of each manifold log to ensue there wasn’t a vacuum in the system while the turbos were spooling up. The decision was taken to use 5 litre engines (4.5’s for Interserie) in the Can Am, the three engines provided to Penske in 1972 had power ranges of between 894-918 BHP dependent upon boost of between 1.3-1.4 bar. Maximum boost chipped in between 5000-5500rpm. The turbo-4.5 litre variant customer engines gave 850bhp. Whilst the engine was butch enough to cope with the additional loads imposed upon it the transaxle was not. Torque produced by the engines was in excess of 700lb/foot so a completely new gearbox was designed and built, 4 speeds being determined as sufficient given the big, fat band of torque. Lubricant was circulated within and pumped through a radiator located above the ‘box. Titanium half shafts were reinforced and splined joints deleted in favor of massive rubber ‘donuts.’ Stub axles, uprights and brake disc bells were all titanium as they were for earlier 917’s. Porsche also developed their own heavily ribbed aluminum brake calipers for the car. 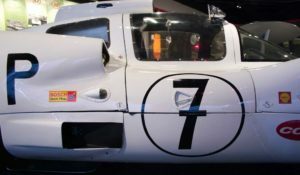 The rout of the Can Am by the Penske and customer Porsche 917/10 and ’73 917/30 is well known, this article is more about the engineering of the cars, but the race summary goes something like this. Donohue popped the car on pole at the 1972 Mosport first round but Denny Hulme took the win for the McLaren M20 Chevrolet. In the Road Atlanta round Mark had a huge accident destroying the magnesium chassis when a rear bodywork locating pin was not secured properly, the departing body and loss of downforce caused the prang from which he was lucky to escape, but Mark did not return until the Edmonton round. George Follmer stepped in, no pressure!, and won from Q2. At Watkins Glen he was 3rd behind Denny and Revvie- The Empire Strikes Back! 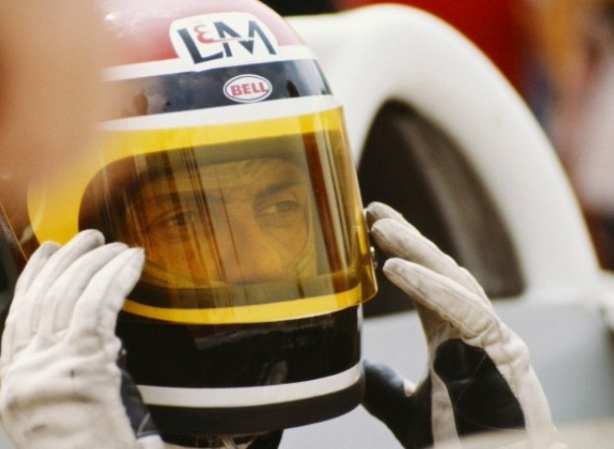 But that was it, George then dialed in to the car and won at Mid Ohio and Road America before Tyrrell F1 driver Francois Cevert, proving his versatility, won in an ex-works M8F Chev at Donnybrooke with George 4th. Donohue won at Edmonton proving he had not lost his mojo upon his return to racing with George winning in California at both Laguna Seca and Riverside and the drivers title, the manufacturers of course going to Porsche. Hulme halved George’s points haul, the Kiwi on 65 with Milt Minter in a normally aspirated 917/10 3rd and Mark 4th despite missing 60% of the rounds. 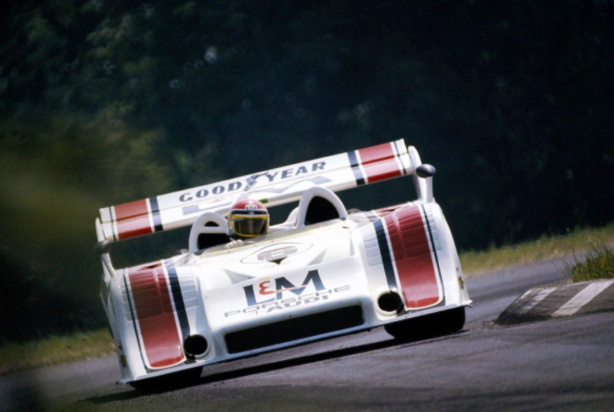 In 1973 it took a couple of rounds to get the evolved 917/30 right with Charlie Kemp and George winning in customer 917/10’s at Mosport and Road Atlanta. From then on though Donohue took the lot, winning six rounds from pole, the drivers title and again the manufacturers championship for Zuffenhausen. McLaren withdrew from the series at the end of ’72, Porsche in ’73- the Can Am, mortally wounded by rule changes which drove away Chaparral at the end of 1970, and now with the departure of McLaren and Porsche limped on but as a shadow, very sadly, of his former self. Shadows of 1974/5 duly noted. Nothing is forever of course, but what a show the Can Am was whilst it lasted. Porsche’s commercial arrangements with Penske were similar to those with John Wyer. 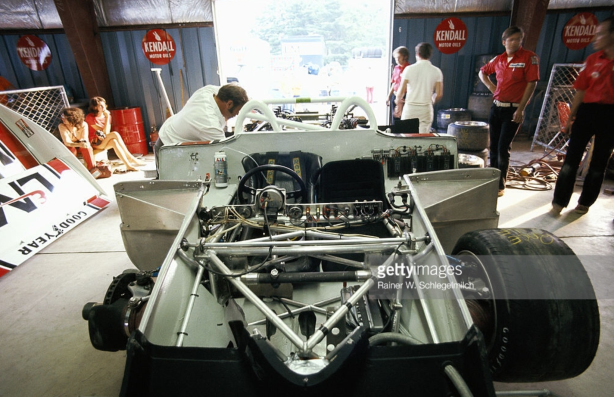 The actual preparation and racing of the cars was Penske’s responsibility, with 5 litre engines were delivered straight from the Porsche Experimental and Racing Department and tended at race meetings by factory engineers. Engine development work was done by the Porsche based upon feedback from the drivers and team as well as the engineers in the field. 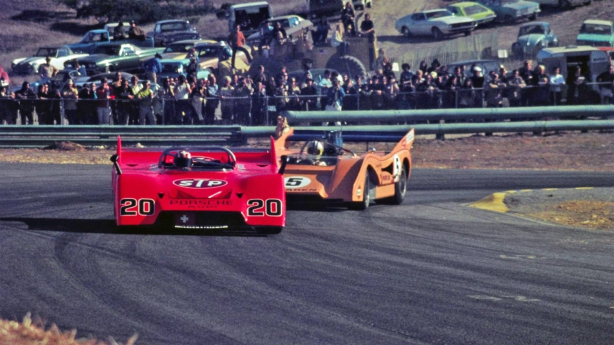 I was at Laguna in Oct 1971 and you could just tell the 917/10 there was the start of something special. Couldn’t have guessed it was a series killer though. This a super development recap. Imagine my surprise to hear of Porsche’s resistance to outside opinions. Not. Walking the pits at Laguna back then was something you could do if you knew the ins and outs. Actually it was not very secure at all. I met Jo Siffert there, got his autograph and talked for a few min. Very nice man. I was really bummed by his death the following week. 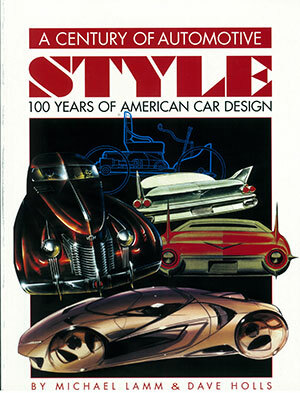 Can-Am was great series, competitive and imaginative. Wonderful experimentation with the UOP Shadow, Chaparral Sucker car among others. Jackie Stewart was the only driver not to use braking in the old turn 8 at Laguna in the L&M Lola, he was quick and this was his secret. WOW! What a fantastic article…wonderful…I had the great fortune to see Mark Donahue race at Mosport in 1972, with my good friend Kip Dodge. 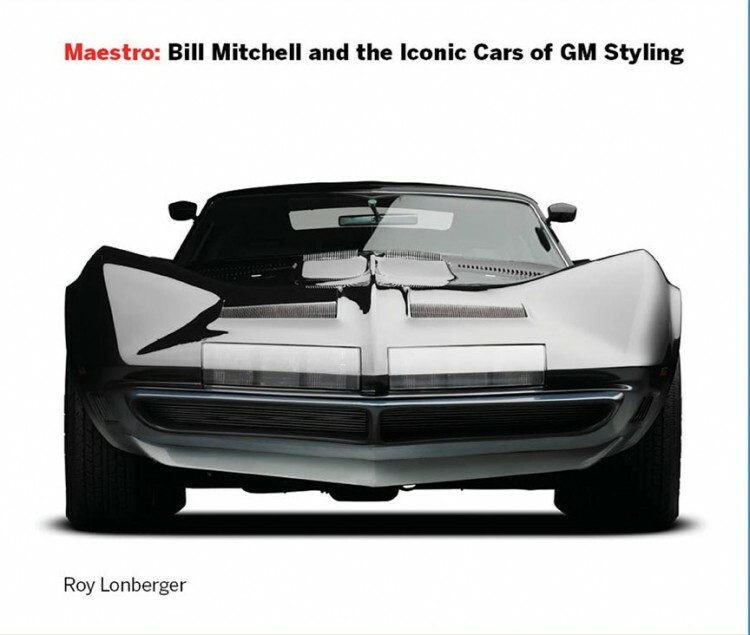 I was a Designer with Ford in Special Projects….. It was a truly amazing experience..as I witnessed how Mark Donahue threw a small bearing in that race and went into pit…..was down by about a lap and half or maybe more…..and with his SPECTACULAR driving came to within maybe 500 feet of beating Denny Hulme in the McLaren M20 Chevrolet. ( What A comeback from behind) Absolutely thrilling race with these monster Race cars. One more Lap and I’m pretty sure it would have been a very tight finish at the wire! I believe Mr. Penske named one of his sons after……… Mark who died in a terrible tire test crash. I’m wondering if the final photo in the article is of David & Michael Donohue rather than 2 identically dressed fans? I saw the Can-Ams run last year at Laguna Seca in August. A thrilling site, it included the Shadows that are now here for the Concouse of the Americas. The sound was unbelievable. What a great story, Donohue’s overall knowledge of engine, handling and driving seems surealistic. A great story, thanks for putting it on Gary. On display in the pits was a 917 chassis that a fellow from California bought about ten years ago. He has worked on it ever since. Without the body you could really examine the details of the different systems and the frame construction. It is really big. A masterpiece of detail and execution, beautifully done, the construction was fascinating. I don’t know how anyone goes racing, on a serious nature, and NOT do everything within the rules to win. If you have a team full of ‘smarts’ from top to bottom, and the money to do it, you do all you can – because generally if you don’t, someone else will. And keep in mind Penske and a few others were doing this long before all the races were on TV or Cable. They wanted to win for the sake of winning, and not for the sake of attracting more sponsorship dollars through TV ratings and exposure. I’d love to resurrect a C/A or F5000 series, but today, with the REQUIRED safety mandates, I don’t know if you can do that. It’s a sue-sue society now, and simply isn’t worth the risk. I concur with J.D. Add to that, Porsche was a tiny company compared to Ford or GM, yet they threw all of their expertise and money behind this effort. If you did a cost comparison. I’m sure it would, proportionately, be a much larger investment than the big US manufacturers. Can’t fault them for commitment though.